Lindi Skin produced a line of skincare to alleviate various skin conditions common among cancer patients. One way they accomplish this task is by using their own unique formulation called LSA Complex. This contains natural botanical extracts that provide antioxidants along with healing, soothing, anti-microbial and anti-irritant properties. All of which equate to a remarkable line of products. Could skincare made for cancer patients be the ticket to beautiful skin? Since Lindi Skin was created for skin at it’s most vulnerable it could very well stand to reason that anyone could benefit from their gentle, yet effective products. After trying the products myself I’ve discovered this to be the case. They’re absolutely lovely to use and they really deliver on results. See full review here. And, or, visit lindiskin.com for more info. 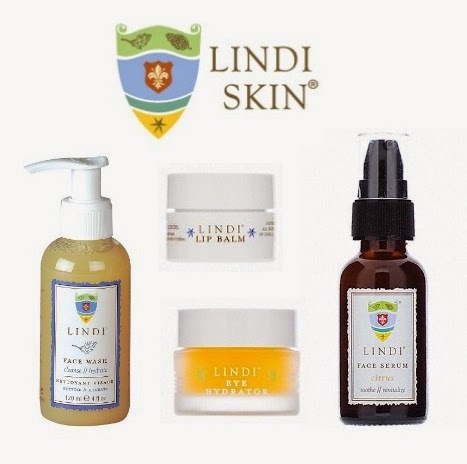 In addition to this website, Lindi Skin products are available at leading hospitals, medical centers, cancer facilities, pharmacies, spas and specialty boutiques across the US. Find Lindi Skin products at a store near you by visiting our store locator. One reader will have the opportunity to discover these amazing products for free! What you get: Face Wash, Face Serum, Eye Hydrator and Lip balm (RV $100.00) use the ridiculously easy entry form below to enter this giveaway. For your tweets to count they must be open to the public and not protected. I learned that some of their products are formulated with a light scent to enhance the overall experience.The scents are created using only natural compounds and were selected by a focus group of cancer survivors along with doctors.